By itself, Prudential’s acquisition of AIA Group from AIG represents a huge fraction of the M&A activity in the last year.A little background: Britain’s Prudential bought AIG’s Asia operations for $35.5 billion in cash and shares. According to the Wall Street Journal, the deal will make Prudential the leading insurer in Southeast Asia and AIG will now be able to pay back a sizeable chunk of the money ($182 billion) they owe the US government. Several banks worked on the deal. Still, this deal is good news for the market recovery. M&A action has been slow since the record pace reached in 2007. 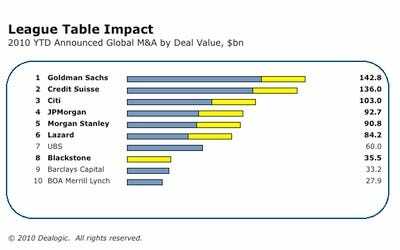 This year, pace has regained momentum (up 29% from June to August compared to the previous three months) but Morgan Stanley still predicts the M&A rebound will be slow for years to come. After winning last year in a tight race against Goldman Sachs, Morgan Stanley won the title for the biggest dealmaker in 2009. Goldman is now back on top.